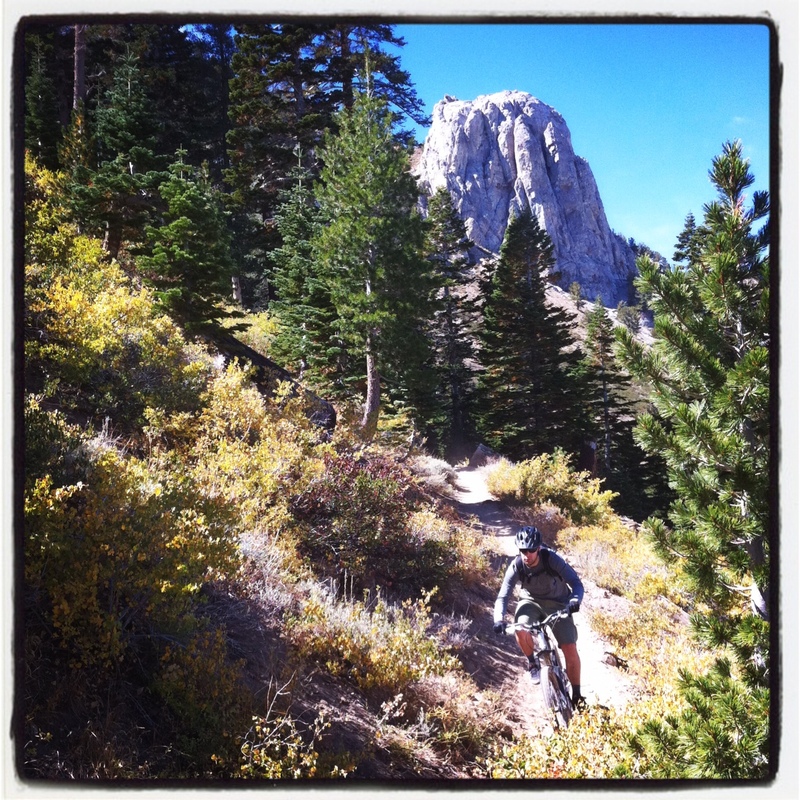 Mammoth Rock Trail is a quintessential ride that every mtb’er who visits Mammoth Lakes must put on their list! 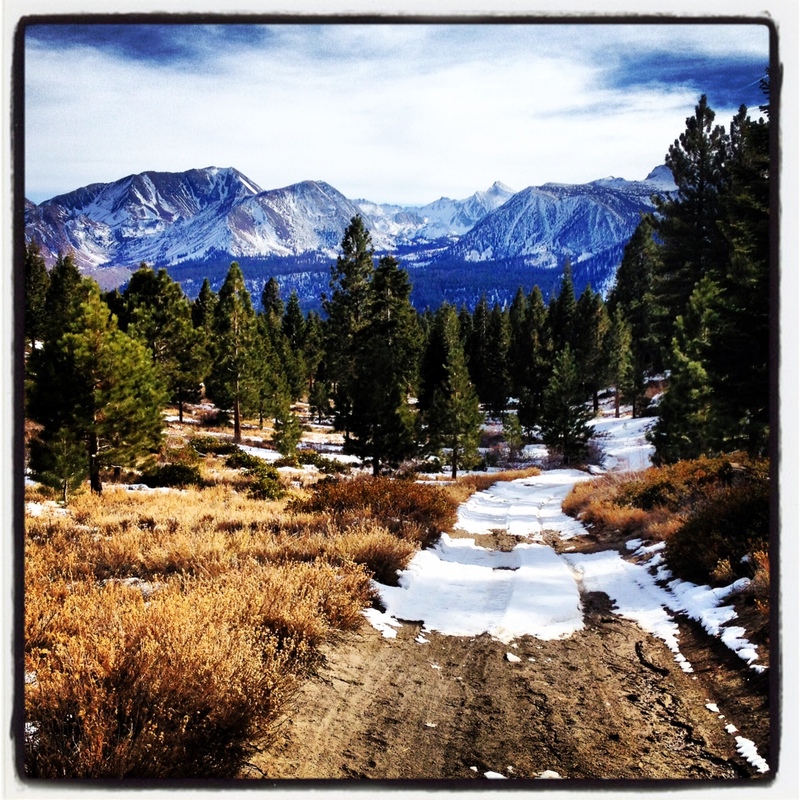 It’s 95% singletrack with gorgeous views of the town all the way across to the Long Valley Caldera and the White Mountains. This trail is open to equestrians, hikers, and trail runners – so be aware. Although many people ride it “down” as a shuttle (described here), you can climb up it, do it as an out and back, or loop it with Old Mammoth Rd (pavement) as well. 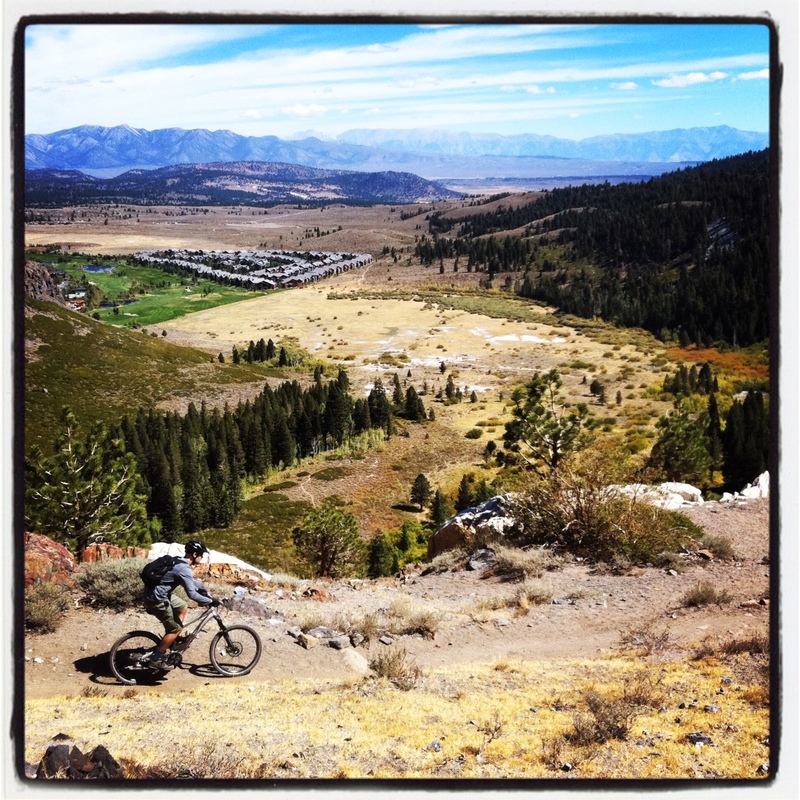 It’s also great to link up with the Panorama Dome Trail, coming down from the Mammoth Mountain Bike Park on the Lakes Trail, etc – contact us about putting together a great ride. The last section right before you reach Sherwin Creek Rd can be pretty sandy, and overall trail conditions vary depending on horse traffic – but all in all, it’s stellar riding, with a few technical sections and some exposure. Intermediate to advanced descending skills a must. This can be a great trail to ride on a fat bike once the snow starts flying. Early winter, or when there’s not too much snow, it can be amazing. It tends to be packed well by snowshoers and hikers during the winter holidays. 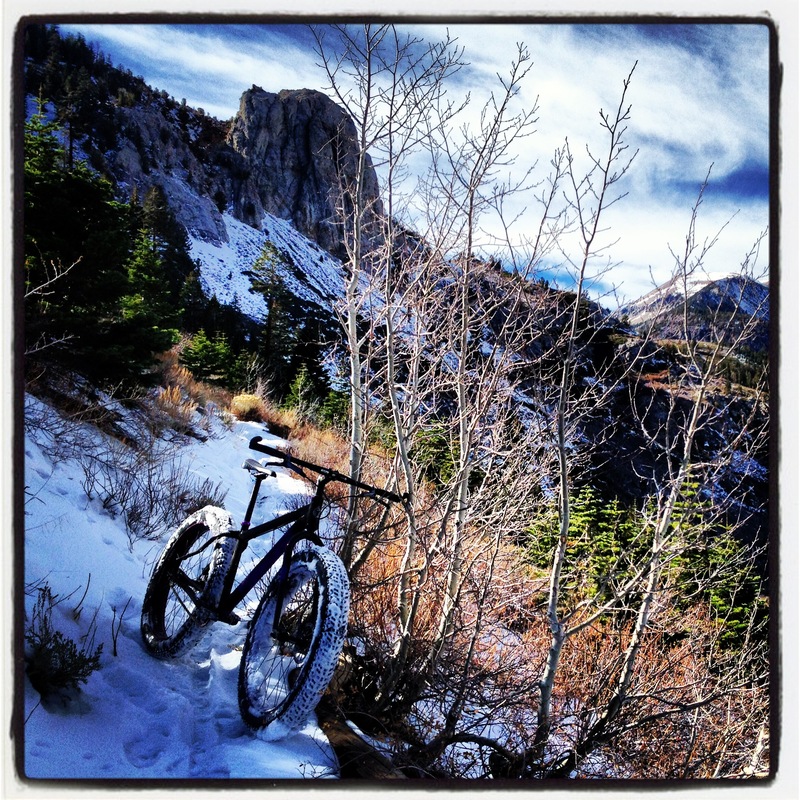 For more riding, it can be combined with the Old Mammoth Rd Snow Ride and/or the Meadows Ride. NOTE: Once there has been enough snowfall, the Sherwins (the mountains that the trail traverses) becomes a very popular area for skiing. Please DO NOT try to ride this trail, or pack the trail for snow riding during these periods. We don’t want to create any danger for backcountry skiers/snowboarders crossing through! Not sure about proper riding conditions? Contact us and we’ll give you the thumbs up or down for snow riding. Difficulty: Moderate to Advanced descending skills required. Some technical/ rock gardens and exposed sections with steep drop offs. If climbing, it can be fairly strenuous depending on trail conditions. Access: Since this is described as a shuttle, you’ll need to leave one car by the lower trailhead. From town, go south on Old Mammoth Rd. Just past Mammoth Creek Park, make a left on Sherwin Creek Rd. Drive for 1/2 mile and park off to the right by the propane tanks / dog walking area (right before it turns into a dirt road). Leave one car here. Head back to Old Mammoth Rd and go left towards Old Mammoth. You’ll go past Snowcreek Athletic Club approx. 1.5 miles. After a steep curve to the left, you’ll see a dirt parking area and the trailhead sign on the left. Park here. No turn by turn directions for this ride, as it’s only one singletrack trail with no intersections except for one “Y” at the bottom where you stay to the right (even if you go left at the “Y” you’ll still wind up at your car). Once you hit Sherwin Creek Rd, go left to reach your car at the lower parking area. 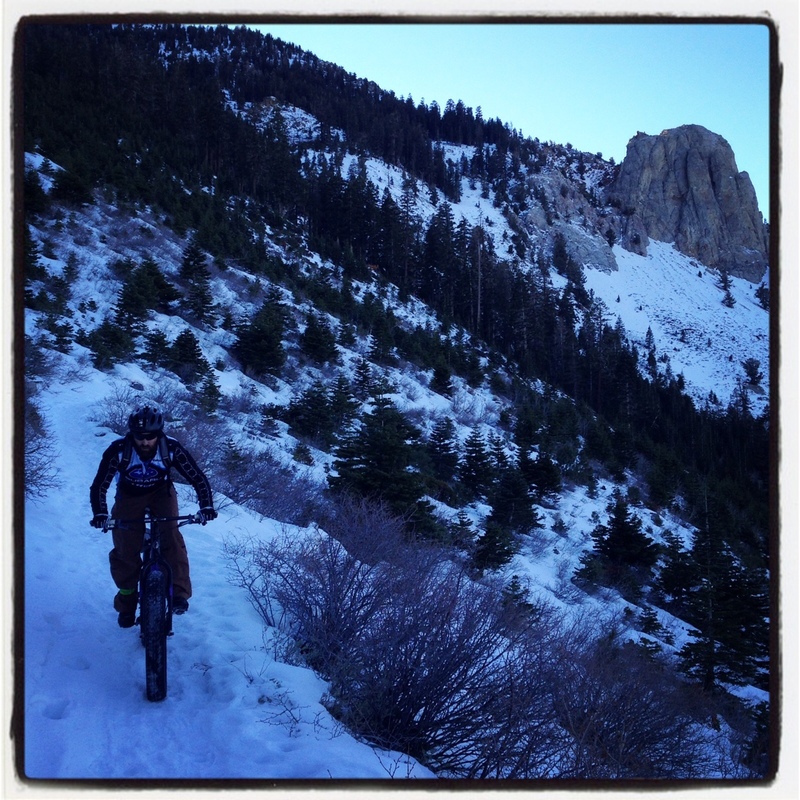 Riding the Mammoth Rock Trail at dusk on the fat bike – such a beautiful ride. If you’re looking for a moderate ride that starts/ends in town, put this on the list. There’s some fun singletrack, but it’s mostly doubletrack/ jeep roads. Great views and an excellent cardio workout with two tough climbs. 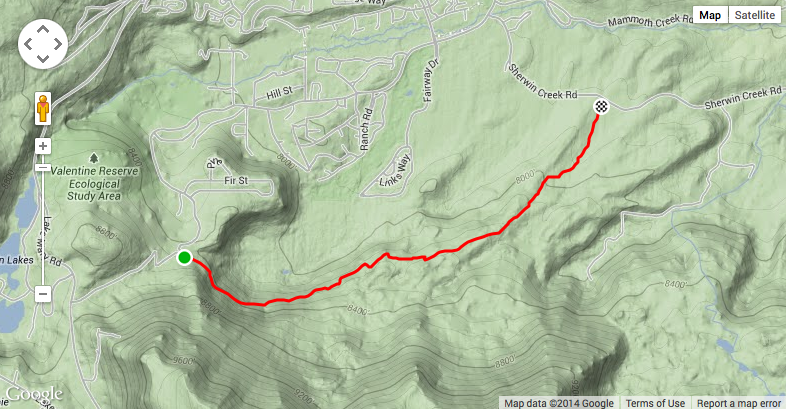 Most notably the short, but fairly brutal “Hell Hill” climb. It can be sandy in parts, depending on time of year and motorized use. This ride is actually the first part of the longer Knolls Loop Ride– so if you decide you want some more, go for it. But if you’re short on time, and want a nice workout with some rewarding views, this is worth a shot. Terrain/Conditions: Mostly 4×4 roads and doubletrack, soft & somewhat sandy in parts. Access: As you drive up Main Street towards The Village, make your first right after the signal at Old Mammoth Rd. This is Forest Trail Rd. (The fire station is on the corner). 100 yards up, look for a small dirt lot on the right. Park here. The trailhead is just ahead to the east. 3.22 – left turn at the big T intersection. you’ll start slowly climbing through softer dirt, eventually it gets pretty steep – this is Hell Hill!! This is one of the oldest “traditional rides” in the area. We’ve tweaked it slightly to add a couple sections of fun singletrack (possibly the best parts of the ride). You can ride it in both directions, but clockwise is preferred for scenery and enjoyability of terrain. The directions below are for the clockwise route. There are a few tough climbs, including the locally infamous “Hell Hill”. There are also some rip-roaring descents, one of which we dub “Mini Kamikaze”. You also get some great views of the Sherwins, especially when heading southbound on the last half of the ride. Overall, it’s strenuous, but minimally technical. There any many options to cut the ride short, including doing the Hell Hill Loop (which is basically the first half of this ride), if you’re not feeling up to a ride this long. It can be sandy in parts, depending on time of year and motorized use. — The turn by turn directions from this point on have not been completed. Please email us for the gpx file in the meantime.